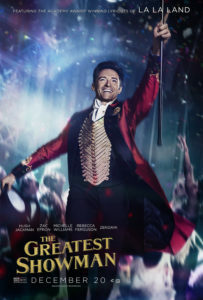 The Greatest Showman is a dramatic musical inspired by P.T Barnum, (Hugh Jackman) the man behind the mystic of the Barnum & Bailey Circus. Unfortunately, the film takes too many liberties with the true historical facts surrounding Barnum, of which we are supposed to forgive. No, not on my watch, this is 2017; one would like to think we’ve come furtherer in filmmaking than to accept blatant fallacies and laziness with American history. The central theme here should have been Barnum’s creativity fueled by his desire for fame and fortune. The film is sidetracked by a far-fetched storyline – that he becomes infatuated with the famous Swedish singer Jenny Lind, (Rebecca Ferguson). Thus, leaving his wife (Michelle Williams) and children to tour with her. Upon his departure we see his sad children following their carriage down the length of the road and also lonely scenes of his wife and kids eating dinner without him. While on tour, Lind is shown trying to seduce Barnum while they’re drinking champagne in her hotel room. One has to wonder what he expected to happen; his shocked reaction comes off as preposterous. Immediately she threatens to quit the tour, which we all know will leave he and his family bankrupt. In reality, there was never a shocking kiss between them that made headlines in the newspapers nor was there a romantic relationship garnered by Lind. This type of false storytelling is clearly defamation of character; I’m sure her family, friends, and fans are furious. According to my research, she quit the tour due to Barnum’s outlandish marketing schemes. She was a highly charitable person and gave generously to underprivileged children; as she grew up in an orphanage. With that being said, my question is why not focus on the real facts by digging deeper? What were the outlandish marketing schemes created by Barnum to publicize Jenny Lind? What purpose other than to gain sympathy for Barnum when he returned home did the untruths benefit? Were the filmmakers focusing on redemption? If so, why include an untrue, unnecessary plot line? We certainly learned nothing factually new about him or his genius abilities in marketing? We are privy only to his goo-goo eyed looks off-stage as he’s moved to tears by Lind’s singing. What a shame, not only to Barnum’s character but also to Lind’s. As for the song and dance numbers, yes, they are enjoyable, to a point. But never really reach the arch, needed to be memorable. One can ascertain that we don’t know the characters well enough, of which I would have to agree. We see a short scene in Tom Thumbs home, which is also based on untruths. I’ll let you research those facts on your own. More about the ‘Oddities’ would have helped the script immensely. The great themes in the film–diversity and acceptance have such opportunity for exploration; why not go there? We have several apt racially sensitive scenes between Zac Efron and Zendaya. However, their characters aren’t developed enough. I wanted to know more about this couple, their attraction and their backstory. If you’ve wondered about other films based on Barnum’s life—there are a few; Barnum was played by Wallace Beery in 1934’s The Mighty Barnum, Burl Ives in 1967’s Jules Verne’s Rocket to the Moon and Burt Lancaster in 1986’s Barnum. The Bottom-Line? In full disclosure; I have a strong interest in P.T. Barnum, having read several books about his life and researching him for a unit of study for the school district where I taught. When I first learned that Hugh Jackman was staring in the new updated film, I was thrilled, yet only to be disappointed at the missed opportunities of the filmmakers to delve deeper—and the focus of untruths.